Here is another account (I won't copy the text) of another far more complex SAR mission in very demanding terrain in New Mexico, which included involvement of CAP, utilizing SAR, HAM, and FRS radios, and relay techniques. The ARRL Letters are full of such stories throughout the past years. Just Google ARRL ARES "SAR". At the very least relocate the antenna to the pack, and get a longer flexible or rugged rigid and specifically tuned antenna. There is so much gain being lost with the short broadband antenna and any close-to-body mount. Something mounted like with this product. Just reading the reviews is illuminating how much difference for radio effectiveness relocation made. A less costly mounting method can be seen in this blog. Mounting to the pack shouldn't be too hard to figure out. Hey! I read that blog a few days ago! For the antenna, at least get a duckie that is tuned to the specific band you're using, ie, 150 MHz. Here is a vendor. I would get the Super Stick II, sure, less durable, but at least is flexible at the base. Otherwise probably the Regular Duck, not the Slim. It is hard to choose between the Super Stick II 160 MHZ and 150 MHZ. One is tuned at 150 MHZ being the band center, the antenna will perform between 145-155 MHz, whereas the other is tuned at 160 MHz being the band center, the antenna will perform between 155 - 165 MHz. We opperate 151-159 MHZ. Preferable IMO would just home-brew something FULL SIZE, like a vertical dipole, with a small diameter rigid copper element 18.5" long sticking up, a PVC fitting center feed line connection point, and a flexible 18.5" trailing wire hanging down out the bottom. Trim for best SWR match at 151 MHz. As the blog states, be very careful obtaining or making the coax pigtail and quick disconnects as cost cutting or sloppiness there can ruin the gain from the relocation. Again, seek out a skilled radio Elmer. Have no idea what any of that meant. Got a picture? You might see who at the Sheriff's office is the commo person. If they hold the licenses being used, hopefully they are somewhat knowledgeable as to what resources are available. Our SAR team has several fixed location VHF repeaters that cover different parts of the county, as well as a field deployable repeaters. We also have 8TAC91-94 repeaters we can deploy, and all our 800 gear has these resources programmed in. Between the 2, we can usually make things work, but you have to have commo folks (COMT or COML) that understand what resources are available, and what best will cover a given area. Command might be handled by 800, while VHF is used for division Tac channels on the ground, for example. In my area, I work closely with our COML's to work up IC-205's for specific events, both as a Fire Chief, and the guy who runs the regional P25 system. Local knowledge of what resources are available - spectrum, repeaters, radios, etc., is critical, especially when you work with multiple agencies who all bring different resources to the table. There are 95 sherrif's offices. We never know which county we are going to until we get paged. Please stop suggesting I fix base. I have no control over how they setup base. I arrive, they tell me what frequency we are using that day, and I go out. You guys have given me a lot of good info, and I will upgrade my antenna, which should help some. But, so far the common suggestions have been fix base, recruit knowledgeable HAMs across the state, and deploy mobile repeaters, but nothing about getting a radio for my truck. I don't know a good mobile radio from a bad one. The one thing I asked for and still have not received is a decent mobile radio that can do a cross-band repeat in the from the 453-459 MHZ to the 150-160 MHZ range. OK, but your commo problems belong there, not on QRZ. You were/are exploring some things that not legal, and could spell trouble for those holding the licenses. Ok I will give you this but again crossbanding in public service frequencies may not be legal but the anytone UV 5888 is a dual band mobile that will operate out of ham band. Now again do this at your own risk as this may not be legal. But aside from the legalities this is a decent mobile radio capable of Xband repeat. VHF 50 watts UHF 40 watts. Now if you go this route make sure you have a decent antenna on the vehicle or your transmission will not be optimal. Either a good dual band antenna or a VHF and a UHF antenna with a duplexer (not the kind for a repeater) this will allow you to have both antennas running at the same time from the radio. Hope this helps. The one thing I asked for and still have not received is a decent mobile radio that can do a cross-band repeat in the from the 453-459 MHZ to the 150-160 MHZ range. I think you already have your answer. I was involved in multi-agency SAR for years as an IC, and I strongly discourage you from using ham grade equipment on public service bands. It is not legal. This was never allowed when I was active at any SAR activity. If you want to play in the big leagues, pony up the money and buy commercial grade equipment. If you want longer range from an HT, get a variety of gain antennas. It is simple to build collapsible two or three element yagis or quads. Look up "Cheap Yagi". Scale the dimension by the appropriate percentage for the public service frequency. Another excellent project is in QST "The Repeater Eater", 2-El quad. Put a counterpoise wire on your HT base. Buy the telescoping whip from MFJ. Use a painter's pole as a walking stick/antenna mast. 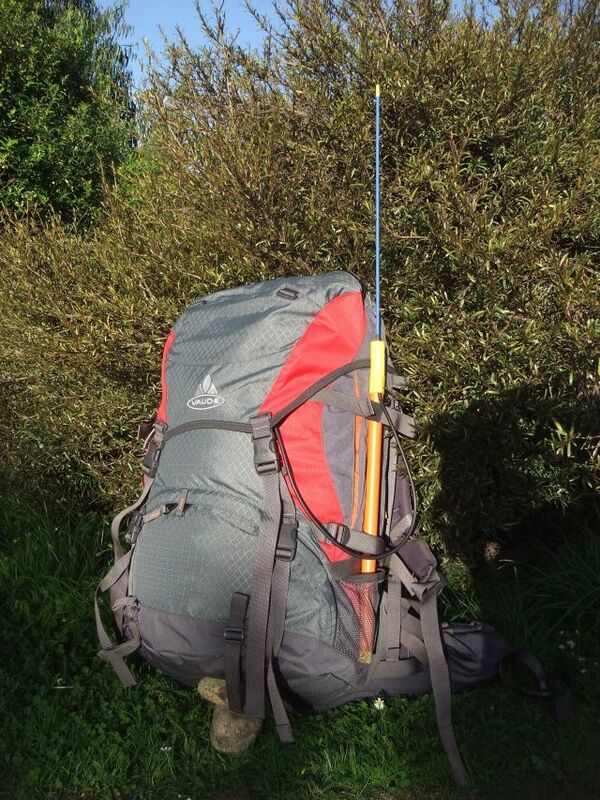 Carry a roll up J-Pole made from twinlead or ladder line. Gottcha first time. Won't see that from me anymore. BUT I do still suggest just trying to connect the people who manage SAR base stuff with VA ARES management, and/or vice-versa. Perhaps just an email or two explaining the desire to improve base-to-HT coverage on field deployments and asking if ARES would assist VA SAR in such matters. Technical design, maintenance, training, base operators, integration with existing Amateur Radio resources in VA (repeaters, etc). Choose the lower freq range, 145-155, because that is the range of longer wavelength, so if (doubtful) it really needed to be tweaked for above, ie, 155-159 Mhz, all that would be necessary is to not fully extend the last telescoping section by an inch or two. Better, here is a SAR group with a product, ironically from your soulmates in New Zealand! (who are also Hams! ) Here is a large photo and a video link below. Unfortunately, that is not mass produced. But it conveys the basic design. It looks to me like a VHF dipole, the top half element being of very flexible material, ie, tape measure-like, and the bottom being just a plastic tube with the other half element, which could just be exposed dangling trailing wire too, but in this case it provides a sturdy support. Here is another blog about making such an antenna out of tape-measure materials. Very rough home-brew, but conveys the idea. Note the photo at the bottom appears to be of an END-FED HALF WAVE, which electronically is not quite the same, but could work fine too. The vertical element, or tape, seen, is approx 36 inches, a full VHF half wavelength. Feeding it from the end requires a special impedance matching network which is probably inside that little square plastic box. However, look close and note the two black cable-wires running out each side of that box and dangling out the bottom. Those are counter-poises which improve the efficiency of the antenna. What I initially suggested, and appears to be with the Kiwi SAR groups antenna, is a CENTER-FED half-wave. The coax can be seen running to the midpoint just below the whip. That does not require any special matching for common 52 ohm coax, so is simpler. And only the top half, ~ 18.5", is sticking up, and, for a smaller pack, the bottom 18.5 inches can just be a wire dangling like seen in the photo. Go hang out at a club meeting some time and enlist a helpful crafty hands-on Ham to help you make one. KM4SPU here. I got my technician license a few years ago and haven't done much with it outside of hitting a few HAM repeaters. I am a search and rescue volunteer and most of my radio use is hand-held out in the woods on SAR missions; usually on simplex. I am very often closer to my truck than I am to base and often have a hard time reaching base with my 8W (Baofeng BF-F8HP) handheld. Since my handheld can monitor dual band, what I am thinking about doing is turning my truck into a repeater where I transmit on a different freq and the my mobile radio re-transmits my signal boosted on the SAR frequency. I am have never dealt with mobile radios or antennae so I am a bit of a newb, so the solution needs to be simple (ie: buy and install, I'm not going to build anything). In addition to the amateur bands, the mobile radio would need to tx and rx between 151.1375-159.4725 and 453.2125-458.7125. I am looking for recommendations of radio and antennae models and setup... and if my plan makes sense. i have a cousin involved with sar in pensacola. you might contact him. FYI @KM4SPU - I was curious what material was used for the super flexible whip seen in the SARtrack video. I believe it to be NITINOL, aka nickle-titanium alloy. That's the same stuff from which super-flex break-resistant eye glass frames are made. On Google there are reasonably priced suppliers of raw wire & rod for home-brewing. There are also several manufactures of antennas using it, primarily for mobile, field-tactical and back-pack HT / portable comms applications. Check out the reasonably priced ready-made HT whips from Signal Stuff called Super-elastic Signal Sticks. There are other vendors too; I googled nitinol whip antenna. Those are probably more durable then the telescopic tube spring based Smiley Super Stick II (these guys gotta find different names ) and with similar performance. Since they are hand-made by Hams, I bet if asked Signal Stuff would even custom tune whips for the slightly shorter SAR band. The whip would snap right on the HT in place of the rubber-duck even on the shoulder mount. Or better, function as the top half of a back-pack dipole (further away from body absorption losses) mounted atop a similar length small PVC tube for support (perhaps just tie-wraps). Then insert a same length wire into the tube and connected to the coax shield as the other side of the dipole. A moot point now, but most telescoping whips can only be used fully extended unless they're marked for different frequencies/bands and then you need to set the length closely. Glad you're still pursuing this!